-Projector ceiling mount plate designed to receive 50mm drop pole. -Ceiling mount plate for 50mm diameter round projector drop poles. -For use on flat ceilings. 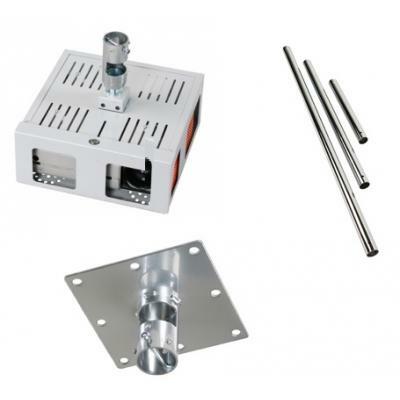 -Projector ceiling mount plate enables the drop pole to be mounted on a flat ceiling. -Pre-drilled holes allow fixing to a range of suitable surfaces. -1000mm long 50mm diameter chrome plated steel pole for projector ceiling mount kit. -1000mm long projector drop pole fixes to Loxit's ceiling plate and suspends the projector via a 50mm diameter compatible projector mount plate. -High quality projector drop pole. -50mm diameter 1000mm long chrome plated steel. -Provides a stylish durable and stable projector mount solution. -High quality steel welded lockable protective case for projector. -Includes universal projector mount arms to mount projector inside the case. -Ball jointed adapter provides fine adjustment of the projected image. -Adapter enables compatibility with standard 50mm drop poles to fit to exising mount kits. -Compatible with Loxit's heavy duty security cable kit. -Standard sized universal projector case provides high quality protection against vandalism and objects such as footballs basketballs etc. -The 50mm ball jointed adapter enables the protective case to be fitted to 50mm drop poles.